Zambia captain Kennedy Mweene says the reigning African champions are aware of the danger posed by Burkina Faso in their final Group C game in Nelspruit. Chipolopolo need victory on Tuesday to be sure of reaching the last eight, although a draw might be enough if the Nigeria-Ethiopia tie finishes level. "They're a team to watch [carefully]," Mweene, 28, told BBC Sport on Sunday. 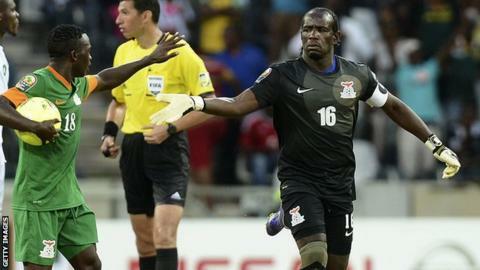 On Friday, the goalkeeper earned Zambia a 1-1 draw against Nigeria when scoring a penalty in the 84th minute. The point kept the southern Africans in the hunt for qualification for the quarter-finals - and Mweene says his team thrives in adversity. "We work well under pressure. We know how sweet it is to be champions and we want to repeat it," he said after training on Sunday. "We just have to keep working hard - and we're not disappointed with the results that we've got [so far]." Following an opening 1-1 draw against Ethiopia, Zambia have yet to win a match as they look to defend the title they won in Equatorial Guinea and Gabon last year. On Tuesday, they face a Stallions side who made history against Ethiopia when winning a Nations Cup match outside of Burkina Faso for the first time ever. Despite being reduced to ten men, the Burkinabe won 4-0 to go top of Group C with four points - two clear of both Chipolopolo and Nigeria. "It's a plus for players when you go down to 10 men," said Mweene of the Burkina Faso display. "Everyone has to push because you know you are a man down. They did well - they are a strong side." One thing that has made life difficult for all the teams in Nelspruit is the state of the pitch at the Mbombela Stadium. "There is a huge amount of sand on it, and very little grass, which makes things especially hard for goalkeepers," says Mweene. "You have to be mindful because you know there's too much sand on the grass so you have to time your run towards the ball - it's difficult for us." But he went on to declare that the team would not "cry" about it, because they intend to stay in town for both the quarter-final and semi-final stages. Nelspruit hosts a quarter-final between the Group C winner and the Group D runner-up on Sunday 3 February as well as a semi-final on 6 February. The 2013 Nations Cup final takes place in Johannesburg four days later.